Gibbs Terraquad is an amphibious Utility Terrain Vehicle (UTV). Conquering land and sea is a feat that usually requires two vehicles. However, Gibbs Amphibians built a Utility Terrain Vehicle (UTV) that allows you to cover both. Their Terraquad transforms from off-road warrior to water-ready ripper in just a few seconds. Terraquad is a derivative of the already established Quadski platform. It has a side-by-side seating configuration, roof bars, and a rear load deck, similar in concept to a typical UTV (Utility Terrain Vehicle). The integration of HSA (High Speed Amphibious) technology however, provides a vehicle platform that can also use waterways, so can access many more areas than an ordinary UTV. The potential applications for this versatile platform in many differing roles are significant. The Terraquad packs a 4-cylinder petrol engine with a maximum output of 140hp. You can go at a top land speed of 50mph and you won’t lose much power on the water, as the UTV can reach up to 45mph on water. While in the water, this UTV is powered by Gibbs’ custom jet technology, making for a nifty way to clean those off-road tires and cool down after rolling through muddy terrain. HSA technology is a major evolutionary leap. High Speed Amphibians lend themselves to a wide variety of uses, from search and rescue to recreation, disaster relief to oil prospecting and military to logistics. 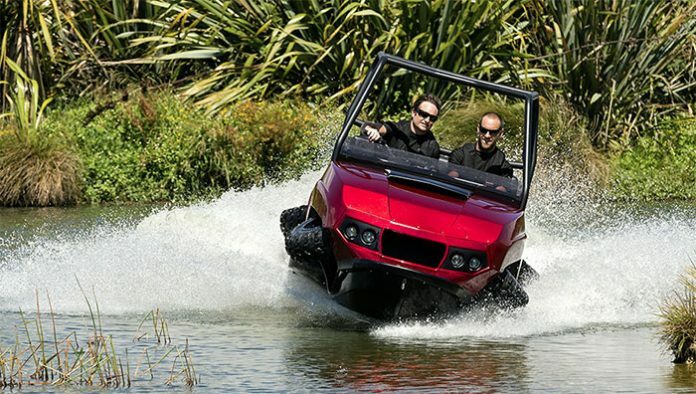 The Terraquad amphibious vehicle is a must-have for outdoor enthusiasts. Check out their website to get a quote. Gibbs Amphibians also offer an opportunity to license its High Speed Amphibian (HSA) technology, enabling the licensees to manufacture, market and sell High Speed Amphibians within an emerging global market.